In a prior perspective piece, we tracked corporate profits and worker compensation as a percentage of GDP. We determined that their respective shares of GDP were highly cyclical, and that they generally moved inversely to each other. We noted that worker compensation as a share of GDP topped out in 1970 and has been declining ever since, meanwhile corporate profit share has been increasing. Furthermore, we opined that the reason this has occurred is because there has been a massive supply glut of labor in the United States. We also noted that this oversupply is in the process of reversing and that it is highly likely that compensation, as a percentage of GDP, has bottomed and will increase over the longer-term. The repercussions of such a change were based on anecdotal evidence from the prior period of compensation growth (1948-1970) and were increased stock market returns, and robust GDP growth. It is the goal of this paper, to further support this hypothesis with more concrete data and explanation. The following analysis is taken from the National Income and Product Account data for Gross Domestic Income by Type of Income (NIPA table 1.10). For those who are unfamiliar, this data tracks U.S. GDP from the income side and breaks it down into compensation of employees, operating surplus (a fancy name for corporate profits, rental income, and proprietor’s income), and they add back consumption of fixed capital (the depreciation expense employed by companies) since this is a non-cash item. For our purposes we simplified the data and only analyzed compensation of employees, and corporate profits which we define as both corporate profits and proprietor’s income. We then tracked the effect that changes in annual compensation, and corporate profits had on GDI growth (the same as GDP growth- they are interchangeable). The data is from 1948 to the present. It makes sense that changes in employee compensation drive GDI growth, since it is the single largest component of GDI, currently accounting for 53.3% of it. Still, as the scatterplot above illustrates, the linear relationship is extremely significant. The r-squared statistic is .88. And for every 1% increase in compensation, GDI increases approximately .9%. 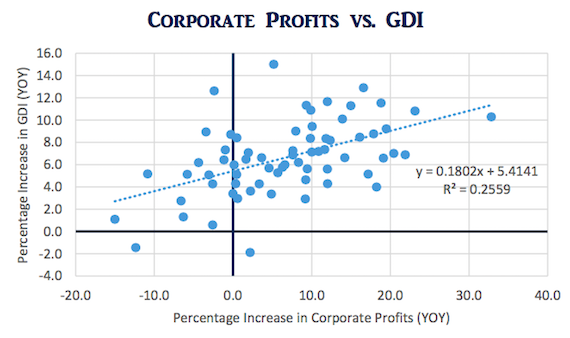 The relationship between corporate profits and GDI is not nearly as robust. The r-squared statistic is unreliable at .26 and for every 1% increase in corporate profits GDI increases a mere .18%. In this study, corporate profits currently make up approximately 18.6% of GDI (remember we include proprietor’s income). This data supports what many have come to expect, that the U.S. consumer drives GDP growth, and that consumption is in a large part, dependent on the amount of compensation they bring home. Surprisingly, changes in corporate profitability have much less of an effect on economic growth. HOW MUCH WILL AN UPTICK IN EMPLOYEE COMPENSATION INCREASE GDP? Using the linear relationship from our scatterplot GDP would increase as indicated in the below table. 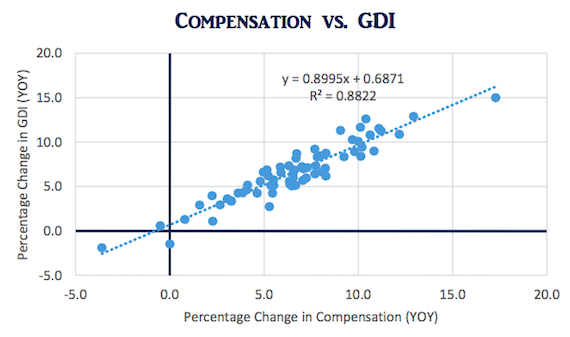 Holding all other inputs stable, including corporate profit growth, increases in the growth rate of employee compensation has a sizeable impact on overall GDI (or GDP) growth. If employee compensation is poised to rise over the next couple of decades based on the reversal of the labor supply/demand curve, what type of compensation growth can we expect? During the 1948-1970 timeframe whereby compensation was increasing its share of GDP, compensation growth averaged 7.0% per year. Since 1970, it has been slightly less, averaging 6.4%. However, compensation growth continued to rise dramatically throughout the 1970’s, even after it was falling in terms of its share of GDP. The reason for this was that there was a substantial uptick in inflation. It seems counterintuitive that wage growth and inflation would both significantly increase at a time whereby demographic trends were driving a labor supply glut. But this speaks to the peculiar nature of inflation. Often times it lags these secular trends, and as any central banker can attest, inflation is a spiraling mindset that is difficult to break. Paul Volcker faced this problem in the early 1980’s, and current central bankers are having the opposite dilemma—how to reverse a pervasive disinflationary mindset. In any case, inflationary trends do reverse, they just do so with considerable lag time. 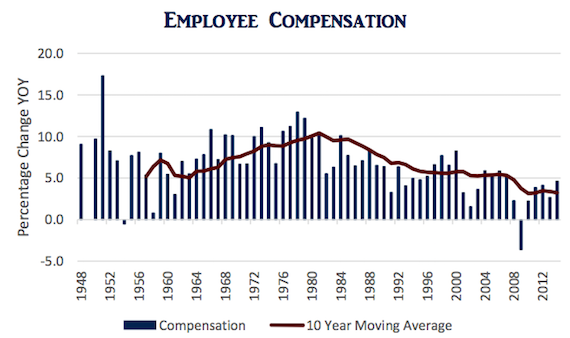 Below is a chart that tracks annual compensation growth since 1948, and the ten-year moving average of that growth. Currently, the ten year moving average is 3.2% and has remained relatively stable post-recession. 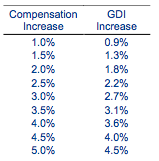 Pre- recession, compensation growth was approximately 5.3%. A return to pre-recession levels, a plausible outcome, would increase the nominal GDI growth rate by 1.87%. Compensation growth oscillated between 5 and 7 percent during the 1950’s and 1960’s, before the influx of the baby-boomer workforce. HOW MUCH WILL A DOWNTICK IN CORPORATE PROFITABILITY DECREASE GDP? If employee compensation is stealing GDP-share from corporations, there should be some off-setting effects if corporate profits decline? Right? This is a more difficult question, because as we noted earlier, the relationship between corporate profit growth and GDI growth is tenuous at best (low r-squared). 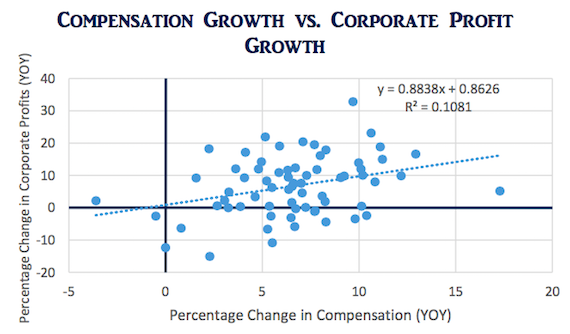 Moreover, upon closer analysis, there is actually a positive correlation between compensation growth and corporate profit growth. The statistical significance is low, but it shows that higher compensation growth does not preclude higher corporate profit growth. This relationship speaks to the symbiotic relationship between corporations and the financial health of the consumers that purchase their products. Indeed, it seems that a smaller piece of a larger pie is beneficial to U.S. corporations. Furthermore, since compensation growth has stagnated near 60 year lows, one might expect that corporate profit growth is close to 60 year highs. The exact opposite is true—corporate profit growth has also been sluggish. The chart below reveals two important facts. 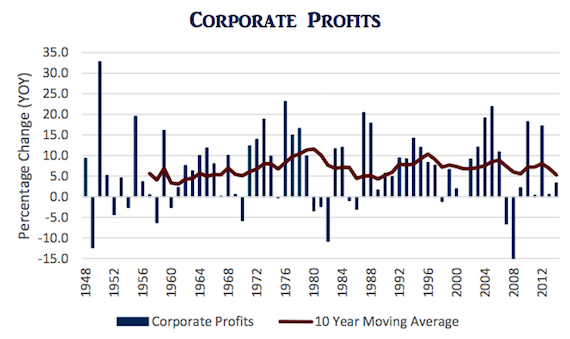 First, corporate profit growth tends to be a volatile time-series. And second, the ten-year moving average of that growth is at the low end of its historical range, currently at 5.3%. Since 1948, there have been three major periods of corporate profit growth acceleration: 1960-1980, the 90’s, and post 2000 until the Great Recession. During these time periods, compensation growth was also accelerating. The U.S. consumer has a high marginal propensity to consume (MPC). When households make more money, they typically spend the bulk of that income. That spending, in turn, increases corporate profits and incomes, which are then redeployed into the economy in a similar manner. This is what economists call the multiplier effect. 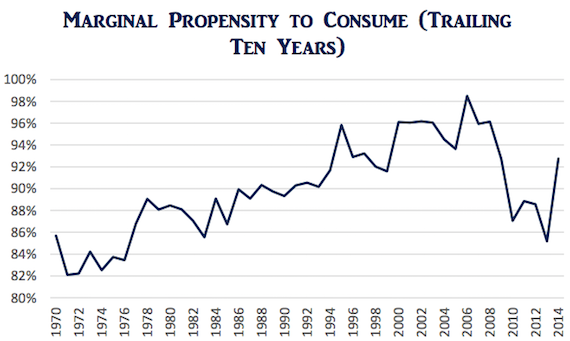 The below chart tracks the Marginal Propensity to Consume over a ten-year time frame. It is calculated by taking the increase in disposable income over a ten-year period, and the increase of household consumption expenditures over that same time-frame. The MPC ranges between 82% and 98% and has typically been right around 90%. This data is taken from the U.S. Bureau of Economic Analysis (Department of Commerce) and is published monthly. Alternatively, savings rates for corporations are much higher, so an increase in cash flow to U.S. corporations does not have the same multiplier effect that an increase in compensation will. 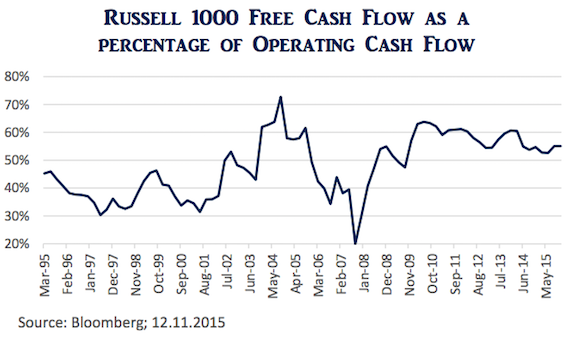 Currently, Russell 1000 companies have a dividend payout ratio of about 53%. That means that they are saving almost half of their net income. When we account for capital expenditures, the savings rate declines, but is still elevated in comparison. The chart below illustrates the percentage that large corporations retain of their cash flow after capital expenditures. The percentage has been declining gradually since the Great Recession, but is still elevated relative to the sub 50% retention experienced in the 1990’s. If we define the Marginal Propensity to Consume for corporations as the percentage of capex and dividends paid to shareholders (the two manners by which corporate spending actually grows the economy) to operating cash flow, it would be 67%, 25% below the MPC for consumers. The importance is that as compensation grows in its share of GDP, and corporate profits decline, the net effect will be positive for the overall economy. Corporate Profits as a percentage of GDP are currently sitting at 60 year highs. Compensation as a percentage of GDP are at 60 year lows. We are at an inflection point for labor supply, and as demographic changes in the U.S. continue, it is very likely that compensation will gain an increasing proportion of GDP, at the expense of corporate profit share. This would be good for the economy and equity markets. The last time this happened (1948-1970) stock market gains, and GDP growth were robust. 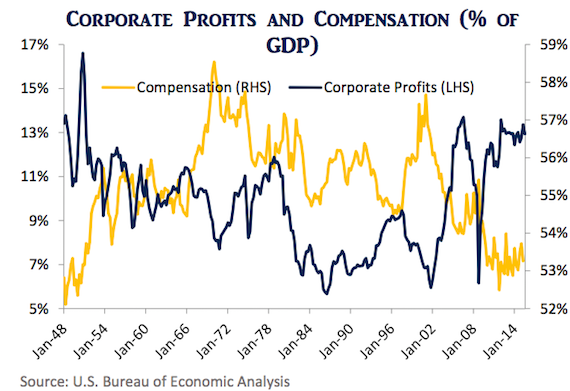 Moreover, since 1970, as corporate profits accounted for an increasing share of GDP, corporate profitability and worker compensation have both been declining. GDP is driven by employee compensation, not corporate profits, because one, consumption makes up a much higher percentage, and two, money in the pockets of consumers is spent at a much higher rate than that of corporations. The answer to the initial question, “who will win out, corporate profits or worker compensation?” is clear. If worker compensation gains GDP market share, both compensation and corporate profits will rebound. And if compensation growth makes it back to its pre-2008 level we can expect an uptick in nominal GDP growth of at least 1.87%. We will save the inflationary and real output effects for another paper. CONFIDENTIALITY NOTICE: The information contained in and accompanying this presentation is confidential. proprietary, subject to legal privilege and intended solely for the intended recipient(s). Distribution without written consent is unlawful.